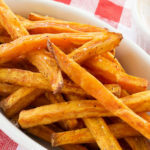 Crispy Baked Sweet Potato Fries Recipe - A Delicious Treat! There are a few simple secrets to making crispy baked sweet potato fries. 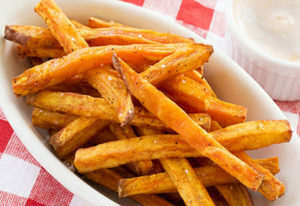 Sweet potato fries are a terrific alternative to classic french fries. But instead of frying them in unhealthy oils, baking them in the oven is a much better option. Crispy baked sweet potato fries made right at home! The biggest downfall to oven baked fries is that they don’t taste as crispy as those that are fried. However, by following a few simple tips, you can make your own crispy baked sweet potato fries right at home! First of all, make sure that you use standard olive oil to toss the potatoes. You should not use extra virgin olive oil. The smoking point of olive oil is higher than extra virgin. This will allow the potatoes to crisp up and the oil will not burn (smoke) off. Secondly, place your oven rack on the top third of your oven. This is usually the second rack down from the top in most ovens. This will prevent the bottoms from burning and allows the top of the baked sweet potato fries to crisp up. And finally, use parchment paper whenever possible. This allows the oil to remain right under the sweet potato fries rather than sliding across the rimmed baking sheet. If you don’t have parchment paper then place the rimmed baking sheet in the oven when preheating. Place the fries on the hot baking sheet which will also help the fries become crisp. No need to deep fry these sweet potatoes. You can enjoy crisp sweet potato fries made right in your own home. Heat the oven to 400 and place rack on top third of oven. Cut the sweet potatoes into 1/4 – 1/2 inch thick sticks and toss them with the olive oil in a large bowl. In a small bowl mix together the garlic powder, paprika, salt and pepper. Sprinkle seasoning on the potatoes and toss until well coated. On a parchment lined rimmed baking sheet(s), spread out potatoes in a single layer. Bake for 15 minutes, then flip and cook until the other side is crisp, about 10 minutes. ← 4 Ingredient Classic Guacamole Recipe – A Healthy Snack!